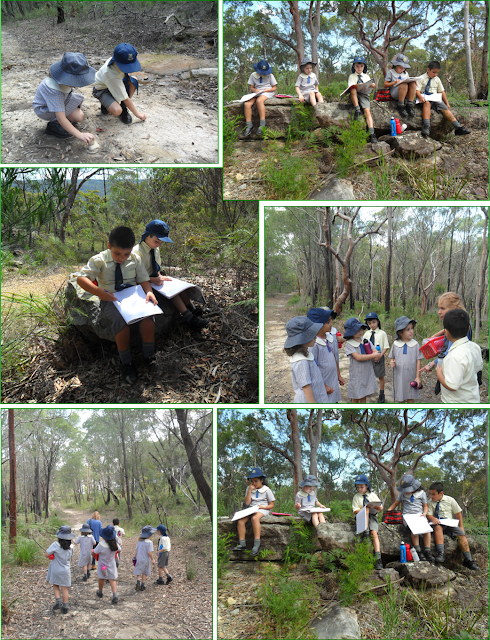 On Monday we went to the Ku-ring-gai National Park. I went in Mrs Dernee’s car. We saw some animals on the way. When we got to the park we walked and we saw rocks and we scratched them and it made sand. Next we came to an ant hole. Then we came to the rocks and we sat down on the rocks and we opened our sketch books. Then we walked and walked and we went to a big rock. We opened our books and picked a tree to draw. Then we went back to school in the car. We opened the window and closed the window and then we got to school and it was time to go home. On Monday we went to Ku-ring-gai National Park. When we were driving to the park we saw a baby wallaby and some ducks. First we walked and we saw lots of interesting things. When we got there we walked and the first thing we saw was an ant hole. 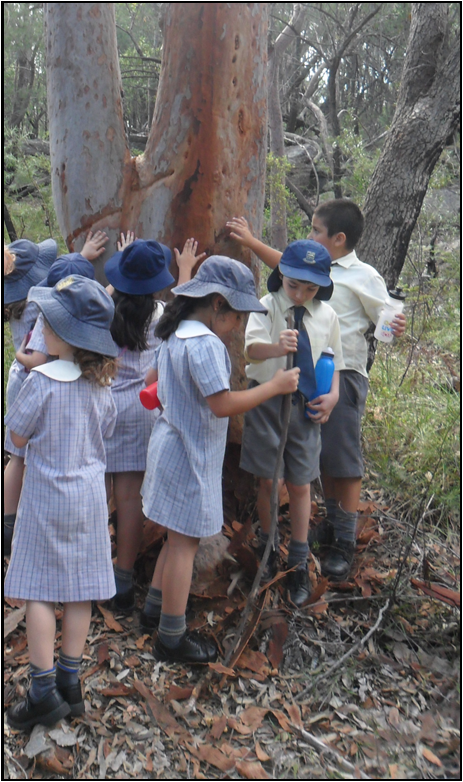 After we saw the ant hole the next things we saw were two trees and we felt the bark on the trees. The first tree was really smooth and the second tree was all rough and bumpy. After we saw the things we sat down and drew some rocks and plants. We walked and then we went back to school. We stopped and we saw an interesting tree and it was so smooth. It was fun to feel the tree. We took our bottles and our pencils on our walk. We went on Monday and we saw interesting stuff. We stopped and we drew. 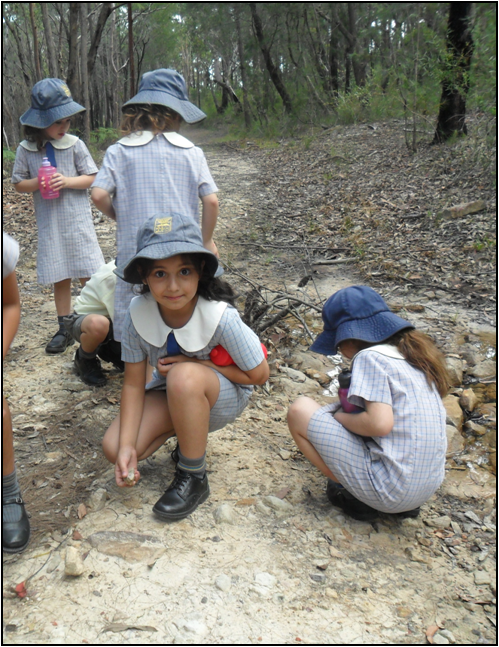 The people who came on our excursion were Lara, Alex, Lilit, Kevork, Christopher, Mrs Laura, Mrs Dernee and me. When we were driving in the car we saw a wallaby, a horse and some ducks. When we were walking we saw very, very interesting things like a baby lizard, a butterfly and an ant hole. The ant hole was made out of interesting sand from the ground. When we walked a long way we saw a beautiful view. 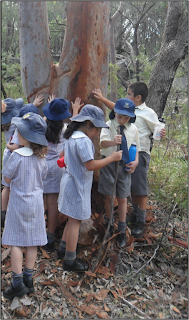 Before we went to the view we saw a tree and we felt the tree trunk. The tree felt different in different parts. The red part of the tree was smooth and the white part of the tree was normal. 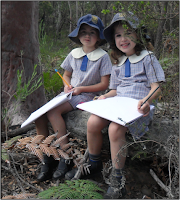 When we sat on the big rocks we started drawing some plants. Christopher drew seven, Kevork drew three, Lilit drew two, Alex drew one, Lara drew two and I drew two. We went to Ku-ring-gai National Park. When we were driving we saw a little wallaby. When we were in the park we saw a bull ant hole and Anita spotted a normal lizard and I saw a butterfly. Everyone didn’t know where the sand on the ground came from. Mrs Dernee told us how the sand got there. We rubbed one rock on another rock and we made sand. These rocks were called sandstone rocks. We went to a nice and peaceful view. We started to draw some things like little plants and little flowers. We saw trees with rocks on it. We went to another place and it had lots of sticks and lots of trees. I was nearly going to get lost. On Monday we went to Ku-ring-gai National Park. We saw interesting insects like a butterfly. Mrs Dernee showed us an ant hole. Then we started to draw and colour in. Mrs Dernee let us feel two trees one was rough and one was smooth. 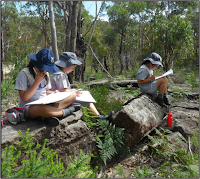 On Monday we went to Ku-ring-gai National Park which is the National Park of Duffys Forest. We saw ducks, horses and wallabies on the way to the park and back. When we got there we first saw a few sandstone rocks. If you rub them together you will find sand and if you rub too much you can make a sandcastle. We also saw an ant hole. It was brownish yellow. Mrs Dernee said that if you disturb them they will attack you. Anita and Lara pushed some sand in.